Paul talked about prayer in his letter to the Colossians. He said, "Continue steadfastly in prayer, being watchful in it with thanksgiving." (4:2) Then he asked the people to pray for him and his fellow workers. He wanted God to give them additional opportunities to preach the Gospel. To understand why Paul told the people to be persistent, to keep alert, to give thanks, and ask for specific things in prayer, we will do a topical study on "prayer". Anytime you do not understand something about your Christian life, you can do a topical study on that subject. You may want to know how to live by faith. Maybe you need to be baptized with the Holy Spirit. Do you know who you are in Christ? How can you live a holy life? Whatever the topic is, a study of it will help you to understand a little more of God's plan for you. As already suggested, one benefit of topical study is to be able to find answers to specific questions we may have about how to live a Christian life. Whether you want assurance of your salvation, or need victory over a fear or besetting sin, or you want to know God's will for you, a topical Bible study will help you find those answers. This is where a Concordance will be especially useful, as you can look up all the Scriptures that use the specific term or related terms you want to study [e.g., prayer, petition, requests]. Search the Bible for passages that teach about the things you want to know. As you study each truth from various viewpoints, compare one reference with another. Then you will be able to rightly interpret God's Word as He intends for you to do. A topical study may take a short or long time to do, depending on the topic you are studying. Some topics, like the "Holy Spirit" or "salvation", occur often in the Bible. In fact, Bible scholars who write books on these topics sometimes spend years searching all the references to the topic. Using a good Thesaurus, write all the words you can think of or find for the particular topic you want to study. For example, for "the Bible", you might list "God's Word", "Scripture", and "Word of God". For "prayer", you might list "appeal", "petition", "supplication", "request(s)", "ask". Using your Bible Concordance, list all the references you can find to the topic you wish to study. Then write both the Scripture reference and part of the Scripture. Next, arrange the references into groups of related material. 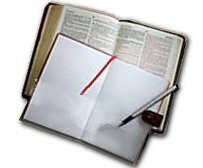 For example, if you are studying the Holy Spirit, you may have lists or sub-lists for "Works of", "Baptism of", "Gifts of", etc. Write a title or heading for each list of references. Read each Scripture in its context to be sure of the correct meaning, and then summarize the main points. Obviously, this may involve you placing some verses under more than one heading. First, list all the references to prayer you can find  in this case, those listed above. Write a portion of the Scripture with each reference in order to know what it says about prayer. For instance, for 1 Samuel 1:10-20, you might write: "Hannah continued to pray to the LORD for a long time . . . 'I have been praying like this because I'm so miserable' . . . the Lord answered her . . . she gave birth to a son." Matthew 5:4; Acts 6:6; Ephesians 6:18; 1 Thessalonians 5:25; 1 Timothy 2:1-2; James 5:16. Pray for your children, pray for the lost, pray for the sick. 1 Samuel 1:10, 16; Matthew 26:36-44; Mark 1:35; Luke 5:16; 18:7; Romans 12:12; Ephesians 6:18; 1 Thessalonians 3:10; 1 Timothy 5:5. Pray when you study, pray when you need help. Proverbs 15:8; 28:9; Isaiah 1:15; 59:2; Matthew 6:5; Luke 18:10-14; 20:47; James 1:6-8; 4:3. Isaiah 56:7; Matthew 14:23; Mark 6:46; Luke 9:18; Acts 1:14; 10:9; 1 Timothy 2:8. Genesis 20:17-18; 25:22-23; Daniel 9:21-23; Jonah 2:7; Acts 4:29-31; 8:17; 10:31; 2 Corinthians 12:8-9. 1 Kings 18:36-38; Nehemiah 1:5-11; Psalm 64:1; Isaiah 38:2-5; Matthew 26:41; Luke 22:32; John 17:1-26; Acts 1:24; 4:29; 8:15, 22; 9:40; Romans 10:1; 15:31; Ephesians 6:18; James 1:5; 5:13-14. Jeremiah 33:3; Matthew 6:7-14; 18:19-20; 26:39; Mark 11:24-25; Luke 11:5-13; 18:1, 10-14; John 14:13-14; 15:7; Romans 8:26-27; 1 Corinthians 14:13-25; Philippians 4:6; Colossians 4:2; 1 Timothy 2:8; Hebrews 5:7; 10:22; 11:6; 1 Peter 4:7; 1 John 3:20-22; 5:14-15; Jude 20. 2 Samuel 7:18-29; Isaiah 38:10-20; Matthew 14:19; Acts 10:1-2; 16:25; 1 Timothy 4:4; James 5:13. 1 Kings 8:22; Psalm 95:6; Jeremiah 33:3; Daniel 9:3; Matthew 19:13-15; 26:39; Mark 11:25; Luke 18:13; Acts 8:17; 9:40; 1 Timothy 2:8; James 5:14. Proverbs 15:8; Luke 3:21-22; 9:28-35; 2 Corinthians 1:11; Ephesians 3:20; Philippians 1:19; James 5:16-17; Revelation 5:8. Now you are ready to summarize the main points given under each heading relating to prayer. Remember, the best commentary on the Bible is the Bible itself. Let the Bible speak to you and answer your questions. From this brief study on prayer, you can see that prayer is communication with God. You talk to Him and He talks to you. As you practice the Bible's teachings on prayer or any other topic you choose, challenge yourself to change your habits, posture, culture, etc. Be teachable and be willing to do something different than you've ever done before. If you are truly open for God to speak to you or even correct you during your topical studies, you will receive great blessing from God. Once you have completed your topical study, don't stop there. Continue to learn about it. Add references to one topical study as you study other topics, for the main themes of the Bible are closely interwoven.